The casino game most of us have known and loved throughout the years started out with an invention of August Fey in 1897. The machine, called Liberty Bell, is developed in Fey’s workshop in Market Street located in San Francisco. Fey’s Liberty Bell was developed with there reels holding ten different icons on each reels. It also has a built-in coin slot, a small viewing window and a bottom tray where winnings are dropped. The original design was not to make people gamble but to maintain the traffic of people in saloons, market area and other establishments. Winnings are usually in kind, handing out items like cigar, chewing gum, drinks and others. It was not until a few years later that the machine hands out cash winnings. During the dawn of the 20th century, Mills Novelty Company borrowed the design of Fey’s Liberty Bell and ran away with it. In 1910, they have developed the Operator Bell, a 100-pound cast iron slot machine with the classic fruit symbols. In 1915, they developed a lighter version made of wooden cabinets. In 1930, Mills Novelty Company developed the Silent Bell, which operates more quietly. They have also introduced a double jackpot system where players have the chance to win twice in quick succession. Before 1950s, slot machines are offered mainly to make sure the wives and the girlfriends of high rolling casino patrons are entertained while the latter played their game. Soon, casino operators saw the increasing popularity of the slot machine and began to offer them mainstream. By 1990s, slot machine earnings would tally up to 2/3 of the total casino earnings. Many slots machines retained the Mills design which includes a coin hoper, winnings tray and a triggering level. Random reels are generated through complex relationship between springs, levers and gears. It was not until 1964 when Bally manufacturing introduced an electrical-mechanical slot machine called Money Honey. Their machine comes with a bigger payout rate, multiple coin options and built-in sounds and lights. By 1970s Dollar Machine was developed and was introduced in many casinos. During this time, slot games have further increased in terms of revenues and influence over the casino operations. Other innovation in slots gaming include the development of video poker in 1980s, acceptance of checks in 1990s, development of multiple slot games in1992, and introduction of touch screen slot machines. The development of the slot machine hasn’t been stopped from using electricity and circuitry. With the boom of online gambling during the late 1990s slot was definitely one of the casino games that joined the World Wide Web revolution. This move allows slot games to be enjoyed by a lot of people in a lot of different ways. 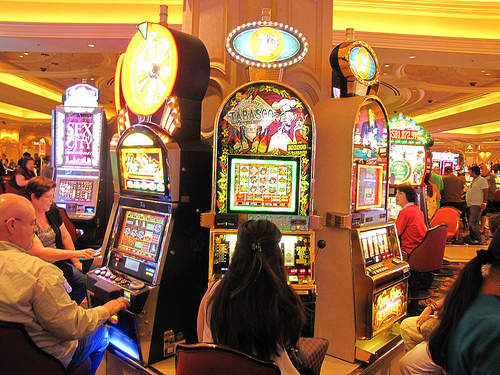 The development of slot games for internet-based consumption resulted in the development in a wide variety of slot games. Now you can play with the reels numbering from 3, 5 and even 7 and with paylines run from 1, 3, 5, 9, 20, or even 25. Furthermore, these slots comes with unique themes and animated graphics that usual brick-and-mortar casino just can capture. With all this changes, one may think that slot gaming has reached its peak. But with the continuous development in the casino industry, it would be quite a long time before we see people getting tired of the reels.